McLEMAN, R., Gemenne, F. (eds). 2018. The Routledge Handbook on Environmental Migration and Displacement. New York: Routledge, 2018. McLEMAN, R. 2018. Thresholds in climate migration. Population and Environment 39 (4) 319-338. McLEMAN, R. 2018. Climate-related migration and its linkages to vulnerability, adaptation, and socio- economic inequality: evidence from recent examples. In B. Mayer & F. Crépeau (Eds.) Research Handbook on Climate Change, Migration and the Law. Edward Elgar, 2017. McLEMAN, R. 2017. Migration and land degradation: Recent experience and future trends. Working paper for the Global Land Outlook 2017, 1st edition. 45p. Bonn: United Nations Convention to Combat Desertification. McLEMAN, R. 2017. Vulnerability. In D. Richardson, W. Liu, G. Pratt (Eds. ), The International Encyclopedia of Geography: People, the Earth, Environment, and Technology. Wiley. McLEMAN, R. 2017. Migration and displacement in a changing climate. In C. E. Werrell; F. Femia (Eds. ), Epicenters of Climate and Security: The new geostrategic landscape of the Anthropocene (pp. 100–107). Washington DC: The Center for Climate and Security. Fredericksen, A., McLEMAN, R., Elcombe, T. 2017. Building Backyard Ice Rinks in Canada: An Exploratory Study. Leisure/Loisirs, 42(1). McLEMAN, R., 2016. Migration as Adaptation: Conceptual Origins, Recent Developments, and Future Directions. In A. Milan et al., eds. Migration, Risk Management and Climate Change: Evidence and Policy Responses. Dordrecht, pp. 213–229. Bird, D., McLEMAN, R. et al., 2016. Climate change and settlement level impacts. In A. Taylor et al., eds. Settlements at the Edge: Remote Human Settlements in Developed Nations. London: Edward Elgar. McLEMAN, R., Schade, J., Faist, T. (Eds), 2015. Environmental Migration and Social Inequality, Dordrecht: Springer. Mezdour, A., Veronis, L. &; McLEMAN, R., 2015. Environmental Influences on Haitian Migration to Canada and Connections to Social Inequality: Evidence from Ottawa-Gatineau and Montreal. In R. McLeman, J. Schade, & T. Faist, eds. Environmental Migration and Social Inequality. Dordrecht: Springer, pp. 103–116. Keizer, P., Gajewski, K., McLEMAN, R. 2015. Forest dynamics in relation to multi-decadal late-Holocene climatic variability, eastern Ontario, Canada. Review of Palaeobotany and Palynology, 219, 106–115. McLEMAN, R. 2014. 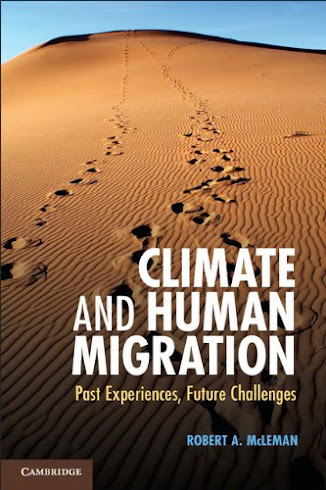 Climate and Human Migration: Past Experiences, Future Challenges. New York: Cambridge University Press. Sioui, M., McLEMAN, R. 2014. Asserting mino pimàdiziwin on unceded Algonquin territory: Experiences of a Canadian “non- status” First Nation. AlterNative, 10(4), 354–375. McLEMAN, R. 2013. Labor Migration and Food Security in a Changing Climate. In C. Barrett (Ed. ), Food Security and Sociopolitical Stability (pp. 229–255). New York: Oxford University Press. McLEMAN, R., Ford, J. D. 2013. How Demographic Change and Migration Influence Community-Level Adaptation to Climate Change: Examples from Rural Eastern Ontario and Nunavut, Canada. In T. Faist; J. Schade (Eds. ), Disentangling Migration and Climate Change: Methodologies, Political Discourses, and Human Rights (pp. 55–79). Berlin: Springer. McLEMAN, R., Smit, B. 2012. Climate Change and Canadian Security. In: Leuprecht, C., Hataley, T., Nossal, K. (eds) Evolving Transnational Threats and Border Security: A New Research Agenda. Centre for International Defence and Policy, Martello Papers, Kingston ON, pp 97–108. Fast, S., McLEMAN, R. 2012. Attitudes towards new renewable energy technologies in the Eastern Ontario Highlands. Journal of Rural and Community Development. 7(3), 106-122. McLEMAN, R. 2011. Settlement abandonment in the context of global environmental change. Global Environmental Change 21: S108-120. McLEMAN, R. 2011. Climate change, migration and critical international security considerations. Migration Research Series report no. 42. International Organization for Migration, Geneva. 50 p.
McLEMAN, R., Brklacich, M., Woodrow, M., Gallaugher, P., Vodden, K., Sander-Regier, R. 2011. Opportunities and Barriers for Adaptation in Canadian Rural and Resource-based Communities. In: Ford, J., Berrang Ford, L. (eds) Climate Change Adaptation in Developed Nations. Springer, Dordrecht, pp 449–460. McLEMAN, R., Herold, S. et al. 2010. Spatial-modeling of historical 'hotspots' of drought-related population change on the Canadian Prairies. Journal of Historical Geography 36(1) 43-56. Brown, O., McLEMAN, R. 2009. A Recurring Anarchy? : The emergence of climate change as a threat to international peace and security. Conflict, Security and Development, 9(3). McLEMAN, R. and Gilbert, G., Adapting to Climate Change in Addington Highlands: A Report to the Community. 2008, University of Ottawa. Sander-Regier, R., McLEMAN, R., Brklacich, M., Woodrow, M. 2010. Planning for climate change in Canadian rural and resource-based communities. Environments 37:35–57. McLEMAN, R. 2009. Climate change and adaptive human migration: lessons from rural North America. In N. W. Adger, I. Lorenzoni; K. O'Brien (Eds. ), Adapting to climate change: thresholds, values, governance (pp. 296-310). Cambridge: Cambridge University Press. McLEMAN, R. 2008. Climate Change Migration, Refugee Protection and Adaptive Capacity-building. McGill International Journal for Sustainable Development Law and Policy 4(1). McLEMAN, R., Mayo, D., Strebeck, E. and Smit, B. 2007. Drought Adaptation in Rural Eastern Oklahoma in the 1930s: Lessons for Climate Change Adaptation Research. Mitigation and Adaptation Strategies for Global Change. 13:379-400. McLEMAN, R. 2007. “Household access to capital and its influence on climate-related rural population change: Lessons from the Dust Bowl years”. In: Farming in a Changing Climate: Agricultural Adaptation in Canada, E. Wall et al. (eds), University of British Columbia Press. Brown, O., Hammill, A., and McLEMAN, R., 2007. Climate Change as the ‘New’ Security Threat: Implications for Africa. International Affairs 83: 1141-1154. McLEMAN, R. 2007. Changement climatique, migration et avenir de la sécurité canadienne. Le Multilatéral 1:20-23. McLEMAN, R. and Smit, B. 2006. Changement climatique, migrations et sécurité. Les Cahiers de la sécurité 63:95-120. McLEMAN, R. 2006. Migration out of 1930s rural Eastern Oklahoma: insights for climate change research. Great Plains Quarterly 26(1) 27-40. McLEMAN, R. and Smit, B. 2006. Migration as a human adaptation to climate change. Climatic Change, 76(1-2) 31-53. McLEMAN, R. and Smit, B. 2006. Vulnerability to climate change hazards and risks: crop and flood insurance. The Canadian Geographer, 50(2) 217-226. Nyong. A., Fiki, C., and McLEMAN, R. 2006. Drought-related conflicts, management and resolution in the West African Sahel: considerations for climate change research. Die Erde 137:223-248. McLEMAN, R. 2004. Refugee protection and sustainable development. Canadian Issues, March, 2004.